Before reaching the consumer, it's highly likely that a group of experts have already subjected the ham to a tasting process based on a set of established quality criteria. The tasting is carried out by a committee of experts in sensory analysis, composed of judges, experts and a jury or panel of selected tasters, who have been trained and educated in order to participate. There are rules that exist in order to systematise the analysis, which has three phases: visual and tactile (appearance and texture), olfactory (differentiating smells) and gustatory (taste). The samples are coded and the results from the tasting are written on a sheet with the corresponding scores for each of the different characteristics. The total sum of points is what determines the final quality of the product. Now let's review a few concepts associated with a ham tasting. What are the phases of an Iberian ham tasting? Shape: it must be elongated or slender, pieces that are wide in the rear are penalised. Cut of the skin: it is usually triangular, with about half of the piece measured from the hoof being free of skin. Size and weight: between 6 and 8 kg. A lower weight means a younger pig with little fat infiltration. Very heavy pieces correspond to older pigs or a questionable breed. Hooves: no deformities. They must be equal and will be penalised if the inner hoof is shorter than the outer one, since any wear and tear of this type may indicate that the animal had been stabled. The fat must be abundant, fluid and yellow on the surface of the piece. White or pink with a faint yellow tint on the inner layers. A certain amount of pink colouration is indicative of quality. When you cut the fat, you can see the progression of the colour, which goes from yellow on the outside to pink, and then eventually turns white. The intense yellow of the piece on the outer layer indicates a long maturation process. Fluidity and elasticity are symptoms of a high presence of unsaturated fats, the result of a diet rich in essential unsaturated fatty acids. The shiny appearance at room temperature is another indication of a good diet. On the other hand, inner fat that is completely white would be indicative of a short maturation period. Colour: hams that have more intense and darker reds are better classified. This indicates that the pig has received an acorn-based diet and has received good muscular exercise during the "montanheira" grazing period. Shininess: at room temperature, part of the fat is in a liquid state, coming to the surface when the ham is cut and quickly acquiring the characteristic shininess that is so highly valued in acorn-fed ham. Marbling: symbol of quality that comes from the intramuscular fat that can be seen immediately upon cutting the ham. Tyrosine crystals: amino acids in crystalline form, product of protein degradation, observed as white spots that appear in the ham. They are indicative of an optimal and prolonged curing and maturation process. Positive smells: acorn, nuts, burnt/toasted sugar, cellar and rancid. Negative smells: fat/oily, moisture, mould, fish, fresh meat, blood, very rancid, ammonia or drugs. Overall, the ham must produce strong, quality olfactory sensations. A high quality ham emanates intense and pleasant smells. Acorn-fed ham has an odour that does not need any comparing, it has it's own unique smell that is not found in any other ham or meat product. As for aroma, it is perceived indirectly. The expert chews the sample for a few seconds and then opens the mouth slightly, breathing in an amount of air that reaches the nose through the retronasal route, detecting stimuli and aromas. Persistence refers to the sensation that remains in the mouth after chewing and ingesting the slice of ham. Depending on how long it lasts, it is classified as weak (3 seconds), medium (10-15 seconds) or high (more than 30 seconds). Aftertaste is defined as the olfactory-gustatory sensation that appears after having swallowed the ham and that differs from the sensations perceived when the ham was in the mouth. Intensity and quality based on the large quantity of volatile and odorous substances that are released during the maturation period. Persistence or permanence of the aroma once the food has disappeared from the mouth. The lasting aromas with rancid and spicy nuances are very characteristic of the Iberian ham and come from the ham's curing process. Cured aroma, which arises as a direct consequence of the use of natural nitrites and nitrates in the salt during the production process. Rancidity, to a certain degree, is considered positive provided it is accompanied by other intense aromas like that of acorns and curing. The texture is also analysed while chewing. The texture of the fat in Iberian ham has qualities that distinguish it from other breeds, with a very soft texture that is much better compared to other hams. The fluidity of the fat is also greater due to the high lipid concentration. Dryness: determines the degree of wateriness in the ham. The temperature, relative humidity, curing process and weight of the piece significantly influence its water content. The ideal humidity is less than 45%. Fibrosity: determines the tendency of the slice to separate into fibres and their resistance to losing structure. It depends on the amount of intramuscular fat and bundles of muscle fibres. 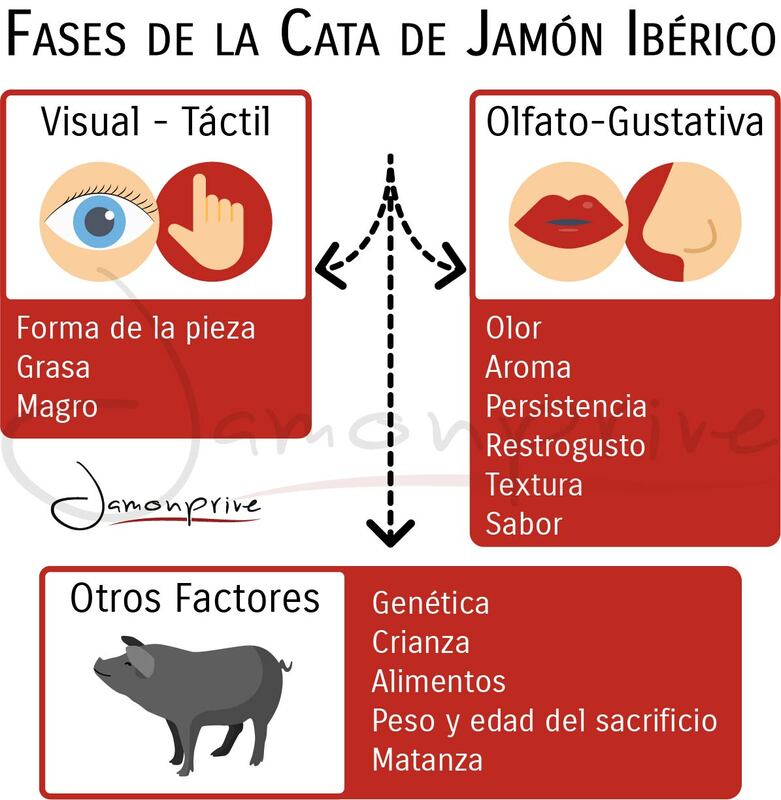 Iberian ham, due to the high rates of intramuscular fat, should provide a sensation of low fibrosity. Juiciness: moisture during chewing plus the effect of the fat on saliva flow are the two factors that make up the juiciness sensation. The greater the juiciness of the piece, the better the ham's quality. Hardnesss: hardness when chewing is very closely related to fibrosity and the amount of fat infiltration. Too much hardness is negative, although a certain degree is appreciated in order to increase chewing time and to favour and stimulate the secretion of saliva. Salty: salt content that is not too high from the nutritional and sensory point of view, and not too low to allow for microbiological growth. Sweet: flavour provoked by the wide range of amino acids and sugar derivatives capable of producing a sweet sensation. Bitter: directly related to sweet, since many of the substances responsible for the sweet taste are also bitter. Acid: it is not common to find this flavour. Umami: considered to be the fifth flavour; present in foods that are rich in monosodium glutamate and is comparable to the taste of meat. What other factors intervene in the final sensory quality? Genetics, breeding and type of diet. The breed and intensive or extensive production method, as well as whether or not the pig is castrated, are all factors that are closely tied to sensorial quality. The same goes for the feeding model: free-range and acorn-fed, free-range and grain-fed, or commercially reared grain-fed pigs. In the extensive system, feeding is usually based on grass and acorn during the final fattening phase, which has a significant influence on the type and percentage of intramuscular fat and positively contributes to the aroma and the appearance of pleasant aromatic notes, and a more reddish colour of the meat. Weight and age at slaughter: Being slaughtered later on at a higher weight produces hardness in the meat; something that also occurs with castrated pigs. Slaughter. Slaughtering the pig in towns that are located close to the meadows where they have been raised is essential in preventing or minimising the stress produced by transporting the animals, which significantly impairs the final result and the excellent quality of the Iberian ham.